If you’ve ever worked with digital video before, you’re probably aware that there are many different types of video files. A digital video file usually consists of two parts. These two parts are called the “Container” and the “Codec”. The container refers to what the actual file type or extension is, for example: .AVI or .MOV. Now, within each of these containers there is a codec which is like a set of instructions that specifies the specific coding and settings of how the video plays on your player. A few popular codecs you may have seen before are: DV NTSC, DivX, Sony YUV. There are much fewer video file containers than codecs, and each container can have hundreds of codecs within them. 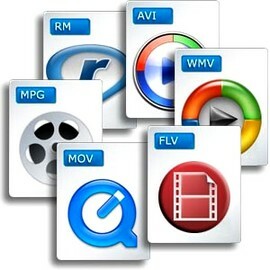 Most of the popular computer video software is actually preloaded with several of the most popular and most used codec and container decoders to properly playback popular file formats. Odd or proprietary types of codecs may require downloading specialty made codec packs from external sources in order to play correctly. There are literally hundreds of video codecs within realm of video formats. Because there are so many possibilities, we may not be able to convert all video files into some of the less popular or proprietary video formats. There are also some video codecs out there that require expensive licensing that we currently can not offer. If you have questions about specific codecs or format containers contact us to speak to one of our expert video technicians. Now, let’s go over the most common video file formats. As you probably know, the last 3 or 4 letters on the end of a video file’s name indicates what the format or file container is. Just like .doc indicates a word file, .mov indicates a QuickTime move file; .wmv stands for windows media video and so forth. AVCHD (.mts) is a high end, high-definition (HD) format which was originally developed by Sony and Panasonic for high definition home theaters. It’s not really suitable for sharing due to the excessive file sizes, but the format is becoming more and more popular due to HD camcorders using this format. Video in this format would be best suited as the master copy of your video project and serves as a great piece to edit with. AVCHD is still in its early life as a video format and since it’s still fairly new, compatibility with certain video editing programs may be an issue. Some video editing software applications have begun to support this format but many of can not fully handle it quite yet. Additionally, playback of AVCHD files requires speedy CPUs and a sufficient amount of RAM. That alone makes this format more difficult to work with but, on the other hand, it maintains high quality. As time goes by, it will no doubt become easier to use and be more integrated with editing applications. AVI format is a long-time standard developed by Microsoft and has been around as long as digital video has. AVI files (particularly when uncompressed) tend to be HUGE, way too big for the internet or uploading to someone. AVI is more for the beginning of a video project using it as something to edit off of, not the end. In that sense, it is not really a sharing format. They’ll slide into just about any video editing program and the quality is still high enough to be a master clip. AVI is windows-based and is virtually universal. The problem is, not all AVIs are created equally and you can still run into compatibility issues due to different codecs on the videos. The important thing to know is that whatever streams inside the container (AVI) is not necessarily the same from one AVI video to the next because the codecs used for compression can vary from file to file. This is because AVI is what’s known as a “container format”, which basically means it contains multiple streams of different type data, including a control track and separate video and audio streams. Flash video (FLV) is the single most common sharing format on the web today. You’ll see the .FLV file extension on videos encoded by Adobe Flash software to play within the Adobe Flash Player. Virtually everyone (99%) has the adobe player installed in their browser and so this has fast become the most common online video viewing platform. Almost all the video sharing sites stream video in flash. You can upload formats other than flash, and those sites will convert it into flash for streaming to the end user. Notable users of the Flash Video format include YouTube, Yahoo! Video, MySpace, and many others. Many television news operations are also now using Flash Video on their websites as a way to keep viewers up to date at all times. Most of those sites accept uploads in a handful of formats like QuickTime, mpeg4, or wmv, and then they convert it to flash or MP4 before actually putting it out on the net for viewing. In addition to the nearly universal flash video player, FLV is popular because it gives one of the smallest file sizes after compression yet it retains fairly good quality. This means that the videos load quickly on the internet, and won’t spend a lot of time using up your bandwidth. If you self-host your own videos, you should convert them to flash for greatest compatibility with the highest percentage of Internet viewers. Although FLV’s are the most common format found on the web today, the standard is moving towards the use of using MP4 H.264 files within flash players as it is compatible with both online and mobile (iPhone), not to mention some HTML5 browser support (Safari, Chrome). MPEGwas developed by the Motion Picture Experts Group. This international group was established in 1988 to develop standards for digital audio and video formats. However, they’re just one of many groups looking to standardize and develop new technologies for digital video. MPEG-4 is another great sharing format for the internet. It’s a small file size, but looks fairly clean in comparison with other video codecs of the same file size. It’s the video format employed by a growing number of camcorders and cameras and it is highly recommended this day and age. In fact, YouTube actually recommends that users upload using MP4 format. YouTube accepts multiple formats, and then converts them all to .flv or .mp4 in their back-end for distribution. As mentioned earlier, more and more online video publishers are moving to MP4 (with H.264 as the video compression codec) as the standard internet sharing format with use within both Flash players as well as HTML5 and most mobile devices. This is the format that we recommend for online delivery of your media. A .WMV file indicates a windows media video file. Windows Media Video is used for both streaming and downloading content via the Internet. Microsoft’s Windows Media Player, an application bundled with Windows operating systems, is built for WMV files. WMV files are of a pretty small file size, actually one of the smallest. As a result of the low file sizes, the videos are compressed so much they start to lose their quality in a hurry. In fact, I’d say the resolution is pretty crummy in comparison to modern codecs. But a tiny file size can be a real advantage in some situations. If you get an email with an actual video attached instead of just a link to a video, it is probably a wmv file. They are the only ones small enough to attach to an email. .MOV is the file extension used to identify an Apple Quick Time Movie. .MOV is an extremely common sharing format, especially among Mac users. It is considered one of the best looking file formats. While MOV files do look great, the files sizes are extremely big. Due to the fact that QuickTime hasn’t been a Mac-only program for quite some time, QuickTime versions and players exist on almost all PCs. The vast majority of the videos we personally upload to the web are QuickTime format, followed by MPEG4. If you see a video file on your computer labeled MSWMM, be aware that this is a windows movie maker project file and not a video or movie file designed for sharing. MSWMM will only play within Movie Maker. When you want to save your movie to share it, use Movie Maker to convert it into a sharing format, such as .mpeg4 or .wmv. The difference between sharing formats and project file formats confuses many people. No matter what video editing software you use, a project file is designed for working on within the editing program. You must convert the project file to watch it on any other player. Now, what streams inside the container is not necessarily the same from one avi video to the next as the codecs used for compression can vary. At DVD Your Memories, when you opt for a video to hard drive transfer, we give you your video tapes as video files in AVI format. This entry was posted in Video Tape Transfer. Bookmark the permalink. Thank you for a concise and easy to use article. I have hundreds of mini dv’s and mini hddv and my mini dv camcorder no longer works. I want to save them all on a master external drive at the highest level of quality and have an apple laptop and an apple desktop. What should I use? Should I buy a new mini hddv camcorder or do they even sell them? Is there a top of the line hdmini tape deck that I can rent for a couple of months? If so, where and what? Thanks…I have gotten a lot of info. from your blog.